Sea of Galilee rises additional 10 centimeters, for a total of 21 cm since weekend. The Kinneret's (Sea of Galilee) rose 10 centimeters (approximately about four inches) since Monday, the Water Authority noted. 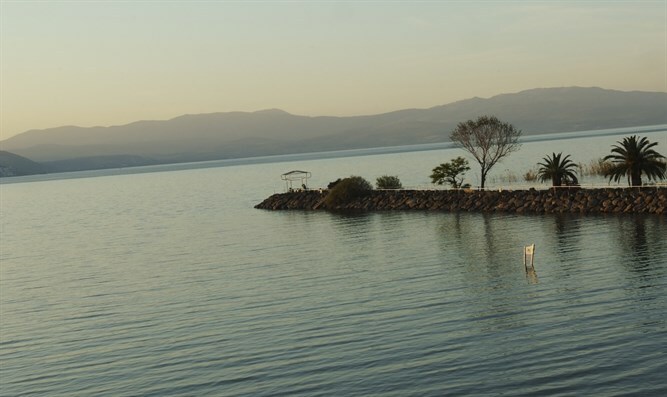 The rise, similar to the one reported Monday, brings the Kinneret to 21 centimeters more than it was at the end of last week. Since the beginning of the rainy season, the lake has risen by 2.8 meters. Now standing at 1.14 meters above the lower red line, the Kinneret would have to rise another 3.06 meters to be full. Local rainfall is expected to continue in northern Israel on Tuesday, lessening in the afternoon. Temperatures will remain lower than seasonal average. Wednesday will be partly cloudy, and temperatures will rise but remain lower than seasonal average. During the night, light local rains will fall across the country. Thursday will be partly cloudy, and northern Israel will see light local rains during the morning hours. Temperatures will rise to seasonal average. Friday will be partly cloudy with a drop in temperatures.